^ Lebowitz, Josiah; Klug, Chris (2011). "Japanese Visual Novel Games". Interactive storytelling for video games: a player-centered approach to creating memorable characters and storie. Burlington, MA: Focal Press. pp. 192–4. ISBN 0-240-81717-6. Retrieved 2012-11-10. Visual novels (or sound novels, as they’re sometimes called) are a popular game genre in Japan. ^ "AMN and Anime Advanced Announce Anime Game Demo Downloads". Hirameki International Group Inc. 8 February 2006. Retrieved 2006-12-01. ^ Brent Ellison (8 July 2008). "Defining Dialogue Systems". Gamasutra. Retrieved 2011-03-30. ^ Fear, Ed (17 March 2008). "Harvard's Rubin on translating 360 epic Lost Odyssey into English". Develop. Retrieved 2009-01-30. ^ Kasavin, Greg (21 March 2005). ""Everything is Possible": Inside the Minds of Gaming's Master Storytellers". GameSpot. CNET Networks. p. 2. Retrieved 2007-08-15. ^ Mark Ryan Sallee. "Kojima's Legacy: We reflect on the influence of Hideo Kojima's 20 years in gaming". IGN. Retrieved 2009-08-20. ^ "騎士07ロンクインタビュー" (in Japanese). Faust. 2005-05-24. Archived from the original on 2017-03-19. Retrieved 2018-05-02. 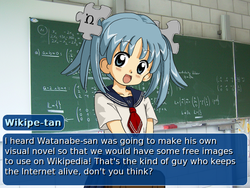 ^ "Walking Further: Delving Into Visual Novels". USgamer. July 3, 2013. ^ "Life Is Strange Director Talks About The Theme Of "Identity" And Visual Novels". Siliconera. February 5, 2015. This page is based on the Wikipedia article Visual novel; it is used under the Creative Commons Attribution-ShareAlike 3.0 Unported License (CC-BY-SA). You may redistribute it, verbatim or modified, providing that you comply with the terms of the CC-BY-SA.